To the unfamiliar eye, it may be very easy to dismiss Digimon as a cheap attempt to capitalize on that late 90's Pokemon craze - but whether it started as a response to the others “mon” franchise or developed independently, Digimon has established one of the strongest fictional universes around. Digimon takes place in a world with two seperate and distinct dimensions: The digital world, and the physical one. The physical world is usually presented as a “30 minutes into the future” view of our present-day existence, usually focusing on urban environments reliant on technology to function. The digital world, in parallel to the physical world, is a space that exists within networked computer space, although it is persistent and not linked to any one hard drive or server; think something analogous to cloud storage. However, the stories in Digimon normally come from one very cool element: The two worlds occasionally converge. This can happen a number of ways, but usually, it involves people becoming digitized and entering the digital world - or the beings from the digital world becoming manifest and entering the physical world. The first series, Adventure, focuses on a group of kids who are trapped in the digital world, who return to the physical world to stop Digimon from destroying the physical world. In the third series, Tamers, most of the series is set in the physical world - one where Digimon exists as a TV show, like ours - as strange phenomena from the digital world start appearing in a reality where that should be impossible. To compare to Pokemon again, Pokemon has always obstensibly been for kids. While some of its secondary media - notably the manga - does get into more mature subject matter and graphic imagery, Digimon has never been afraid to challenge what can be considered “kid friendly”. Starting with the monster designs, while you will definitely see some “cutesy” Digimon, you will also see more ambitious designs in every respect, from horrifying demons to sexualized male and female facsimiles. The narrative elements of the series have never been afraid to take risks, either - when Digimon invade the real world, they kill people. There is very little done to obufscate this fact. Emotional themes in the anime have tackled subjects like crippling emotional isolation, and blind rage after the death of a friend. Where Pokemon’s villains are usually ne’er-do-well dimwits that pose no real threat, the evils of the digital world are constantly a threat to infrastructure, digital life, human life, and the physical world itself, with at least one Digimon coming very close to digitizing and absorbing the physical planet, like some Gurren Lagann horror beast. 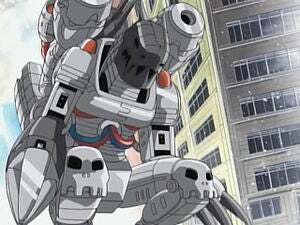 One thing I really dig about Digimon is its spiritual bent. While it doesn’t draw from any one religion, and certainly doesn’t attempt to preach, it does feature a digital pantheon of gods, demons and other dieties that feel like a great mix of its Japanese roots and its western influences. For me personally, I feel strongly that watching Digimon as a kid sort of informed my own spirituality... The idea that a parallel, artificial world could exist, the idea that parallel worlds could somehow converge, that’s become a core element of my own spiritual beliefs. I certainly don’t worship any Digimon, nor do view computers as a gateway to an ethereal plane, but some of the core ideas presented here make my imagination go absoutely wild with blind speculation of other worlds, of other planes of reality. There’s something about the fabric of this fictional universe that really resonates with that side of my brain, and I think that’s part of why I’m still so attached to the series well into my 20s. While Digimon has been silent for a good decade - the franchise went silent after the phenomenal Tamers series took a different interpretation of the established Digimon lore - it seems to be coming back in a big way. The recently-released Digimon film has been met with somewhat positive reception, really playing on Adventure nostalgia. Expect a review of Digimon Story by the end of February. :3 I Got high hopes! PS, I will edit this article further when I get home. Kinja for mobile is very restrictive, so it’s not as graphically or structurally interesting as I would like. Stay tuned!